Recently (seems long ago now!) I decided that a normal fast car just wasn't good enough, that what I really needed in my life was a huge hole in my bank account and a ballistic missile for a car. 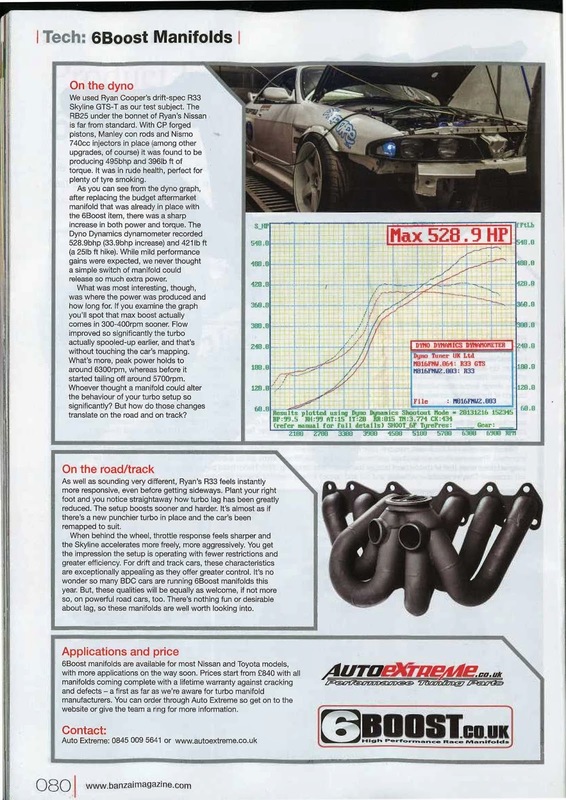 After what some might consider a bit of a shaky start, I actually managed to get down to business talking to Wayne Taylor over at Auto Extreme. So the inevitable horse trading began, with what I thought I wanted and what he thought I should have, it was all quite an enjoyable experience and Wayne is very knowledgeable about all things turbo charged and not only is a supplier for Australian Plazmaman products but 6 boost as well. In fact when put to the test, there wasn't anything he could not lay his hands on at what were very reasonable prices. Although not a 'new' thing 6 Boost mainfolds are still making a name for them selves in the market place. Certainly ideal for a top mount set up on a R33 Skyline they are fabulous high quality parts, heavy thick mandrel bent 'lumps' of metal with heafty tig welds and a manly shot blast finish. These are certainly not for the feint hearted or short on budget as they are reassuringly expensive. 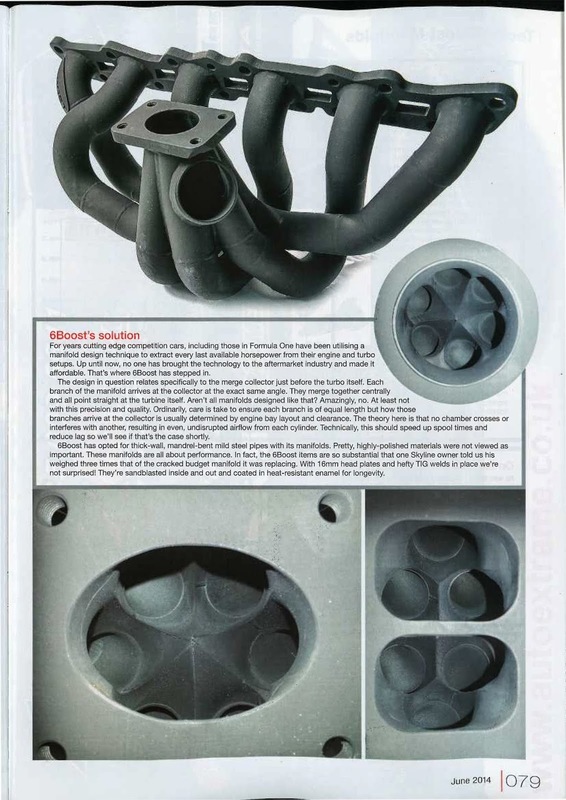 However for the performance inclined, they are the business, reducing spool time, increasing responsiveness and best of all not cracking like the majority of manifolds available out there. Whilst I was trying to be cheap I spoke to a guy in New Zealand selling 'steam pipe' manifolds. He said his were good, not as good as a 6 boost though! With that high quality selling technique I decided to go with the 6 Boost for me. 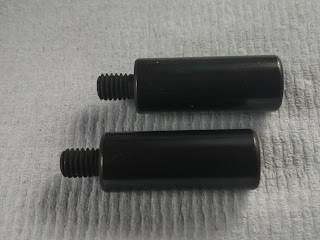 It also helped confirm my decision when at Drift Street Imports I saw that they were pretty much using these exclusively on their competition drift cars. 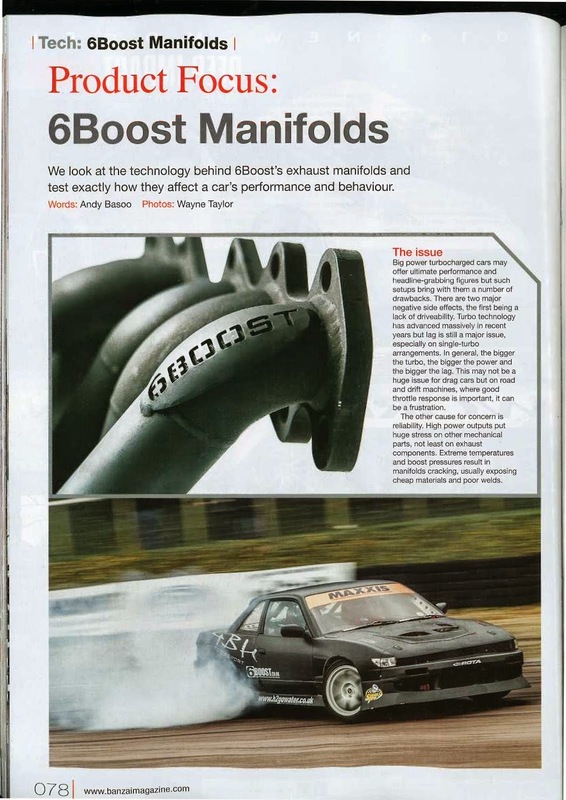 In a quite timely manner I see that there is a large three page spread in this months Banzai Magazine highlighting 6 Boost and its benefits (open pictures in new tab, else text a bit small!). There are two sets of folk, them that has one of these and them that want one (but hate to admit it). Every single drive I take now is an absolute joy, the car has taken a few trips to 'adapt' to it's new found powers and it can be difficult to live with a car trying to constantly 'tear your face off' (thank you MB Automotive). However it has such a good map and is so docile in traffic that I just can't stay out of it!